Lead Poisoning is the greatest threat to trumpeter swans in Minnesota. Trumpeter swans ingest lead fishing sinkers and lead shots when they eat grit and forage for tubers and roots from marsh and lake bottoms. This threat of lead poisoning increases during widespread drought and decreases during wet years. 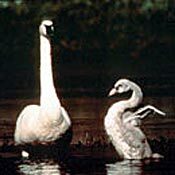 About 40 percent of Minnesota's trumpeter swan fatalities are caused by lead poisoning. Illegal shooting is the second largest threat to Minnesota's trumpeter swans. Typically vandalism, not hunting, is the threat. 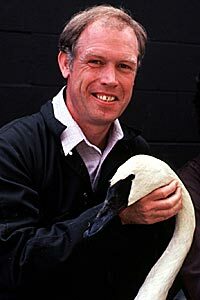 But hunters do need to know the difference between swans and snow geese to prevent accidents. Ongoing education efforts are necessary to teach hunters the differences between trumpeter swans and other waterfowl. People who shoot swans in Minnesota face stiff fines, possible confiscation of their shotguns, restitution charges of up to $1000 and loss of hunting license. Power lines are responsible for some trumpeter swan losses. Cooperation with power companies to install markers on wires in appropriate areas will help minimize this threat.